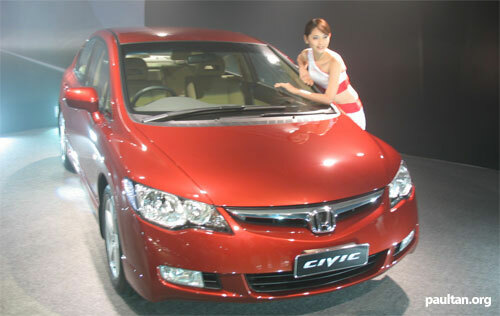 The 2006 Honda Civic was launched today at the KL Convention Center. This would be the 8th edition of the Honda Civic here in Malaysia since it’s introduction here back in 1977. The Civic started out as a compact car for the masses, economical, clean and affordable. It’s definitely come a long time since then. I was there first person at the launch this morning to bring you the latest details on this beauty. 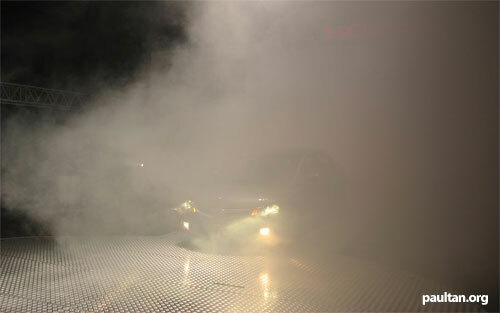 The new 8th generation Honda Civic was unveiled in a cloud of mist. Civics have excellent 2nd hand value in the market here in Malaysia, with demand for the EK and even the older EG chassis still high because they can host the venerable B16 VTEC engine. Hot girl, hot guy, and hot car. The JDM Honda Civic which was targetted at the Asia market had some input from Malaysian customers. 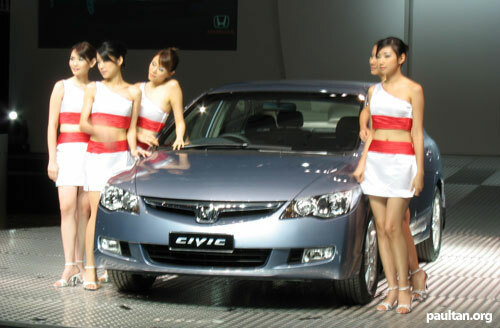 Honda did a survey back in May 2003 to find out what potential customers expected out of the Honda Civic. These requests have been incorporated into the new Honda Civic. It carries elemants of a good driving experience, comfort, spaciousness, fuel economy and safety. The new 2006 Honda Civic comes in 2 forms, the 1.8S and the 2.0S. From the exterior, you cannot really tell the difference between the 1.8S and the 2.0S other than the badges at the back of the car. Both comes with 16″ alloy rims (205/55/R16), fog lamps and dual tail pipes. But the 2.0S has signal lights on the side mirrors and HID headlamps for better driving visibility at night. The wiper blades on the car look interesting. The fulcrum is positioned at opposing edges of the windscreen instead of one at the side and one at the middle like conventional wiper positions. Honda’s excellent attention to technological detail ensures even the wiper blades are designed to be aerodynamic. This reduces wind noises giving you a quieter ride. As for the interior, the 1.8S has a beige interior with cream coloured seats while the 2.0S has a blue theme with blue leather. Interesting choice of colour there, as normally one would use a grey and black colour scheme for a sporty feel. The steering wheel has a smaller diameter by normal standards, though not as small as those OMP or Momo sports steerings. It has both telescopic and tilt adjustments to suit your driving position. For those who don’t know what that means, it means you can adjust it up and down in a 40mm range, and further and nearer to your chest also in a 40mm range. The seats are height-adjustable within a 50mm range. 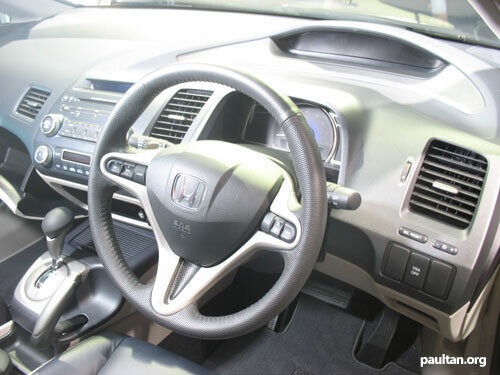 Both the interiors comes with what Honda calls a Multiplex dashboard, with important controls that need to be monitored at the top desk and everything else at the bottom deck. 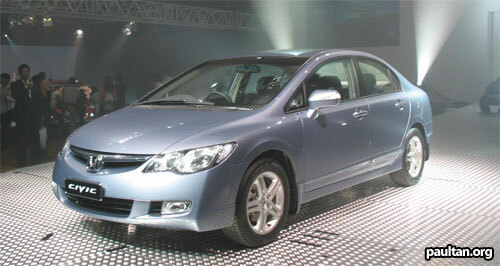 The meters are of the self-illuminated type, like Toyota’s Optitron, the new Honda City’s and the Honda Accord’s. The shift lever and the strange yet practical Z-shaped handbrake are pretty small sized and take up little space and is pushed towards the front of the cabin to make additional storage space in the center console area. Both the 1.8S and the 2.0S comes with a 6-speaker audio system. 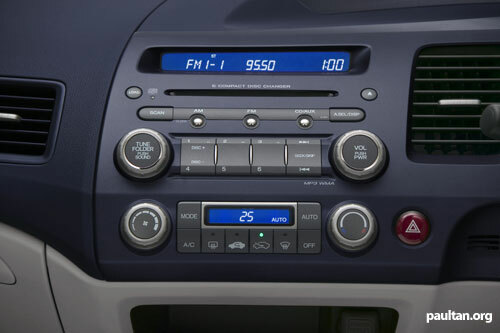 The 1.8S comes with a single disc CD/MP3/WMA player while the 2.0S has a 6-disc in-dash CD-changer. The 2.0S also has audio controls on the steering wheel for volume and track control. As for safety, both the 1.8S and 2.0S models have dual SRS airbags, while the 2.0S has an additional side airbag with Occupant Position Detection System. All models also feature an Active Headrest system, where the headrest moves forward in the event of a collision to provide support for your head. Other safety features include anti-pinch safety power windows for the driver’s side, an immobilizer alarm system, Vehicle Stability Assist (VSA), Electronic Brake Distribution (EBD), Anti-lock Brake System (ABS), and Brake Assist (BA). These are available on both models. VSA can be disabled with a button on the dashboard for a more crazy on the edge driving experience whenever you need it. The 1.8S is equipped with a hydraulic power steering while the 2.0S gets an Electronic Power Steering. 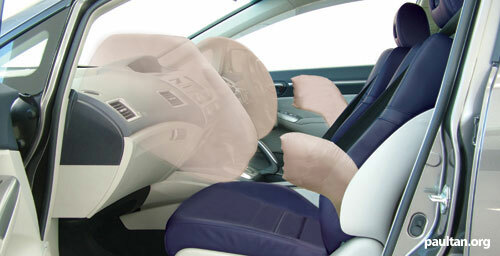 Driver, passanger and curtain airbags for the 2.0S model. Boot size is pretty respectable at 450 litres, though nothing that could cause your jaw to hit the ground like the Honda City’s 500 litres. 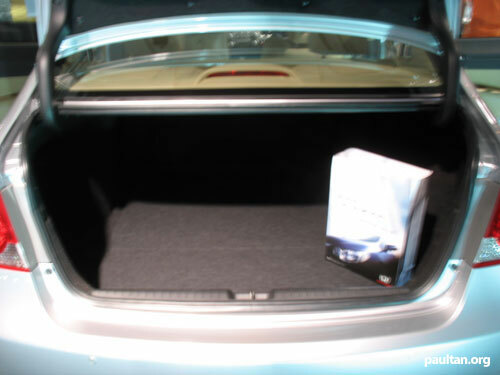 The interior has ample storage compartments. 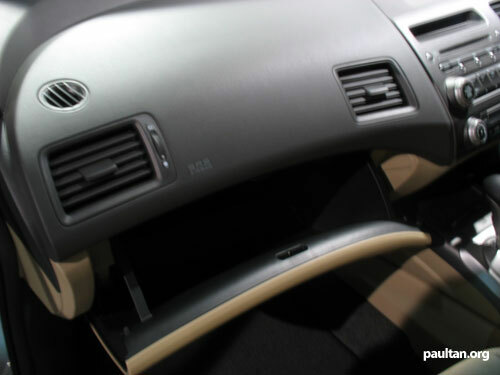 There is a console in front of the gear lever, as well as a sliding shutter in between the two front seats which unveils yet another storage space. This storage space contains two cupholders. To suit your ergonomics better, the armrest slides forward and backward in a 80mm range. Lifting it reveals a console box with storage for 27 CDs. 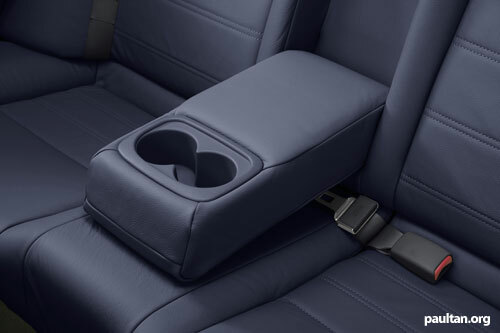 The rear passengers also has a fold-down armrest in the middle with two cupholders integrated into it. The Honda Civic 2.0S rear seats can be pushed down like the Honda City’s UltraSeats. Why this is not offered on the Honda Civic 1.8S strikes to me as strange. Honda’s target market for the 2.0S are young entrepreneurs or young men from rich backgrounds in the 25 year old to 35 year old range. The 1.8S’s target audience is the 35 to 45 year old professionals with families. Surely someone with a family would find foldable seats more useful than a young man. This was the exact same rationale they used in removing UltraSeats from the facelift City VTEC. Strange. A goodie bag in the boot for scale. Passenger seat glovebox. I didn’t like the feel of it. Seemed hard to get the latch to hook when it closed. Maybe it was a defect on that particular car. Let’s go to the engines. 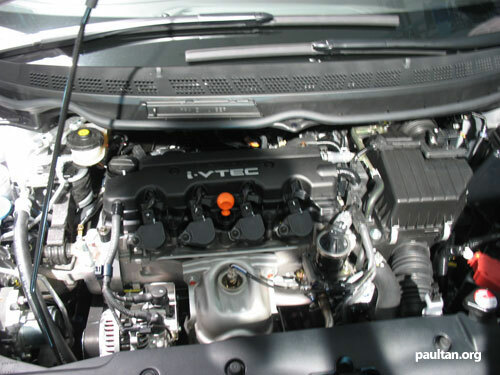 I’ve already posted about the new i-VTEC SOHC 1.8 engine before, but let’s have a recap. 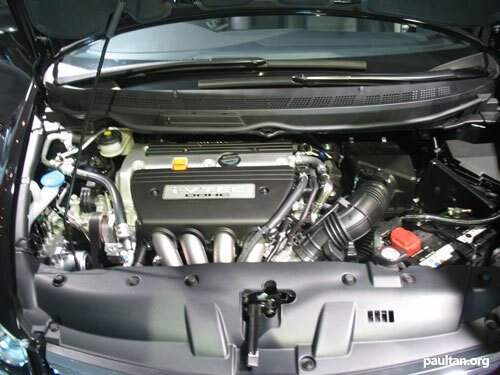 The 1.8 i-VTEC engine in the 2006 Honda Civic 1.8S is a single camshaft 4-cylinder engine with Honda’s i-VTEC system. It uses a timing chain instead of a timing belt. It makes 140hp at 6300rpm and redlines at 7000rpm. Max torque is 174Nm at 4300rpm. This is mated to a 5-speed automatic transmission. Which is nice, because normally 5-speed autos have only been available on more upmarket models with larger engines. Honda claims this 1.8 i-VTEC engine has the fuel consumption similiar to 1.5 litre engines but has the performance characteristics of a 2.0. From the figure sheets, the latter claim looks to be true. The 2006 Honda Civic 2.0S is powered by a 2.0 litre DOHC i-VTEC K20 engine. It is also timing chain-driven. It makes a higher 155hp at 6500rpm, redlines at 7000rpm and makes 188Nm of torque at 4500rpm. 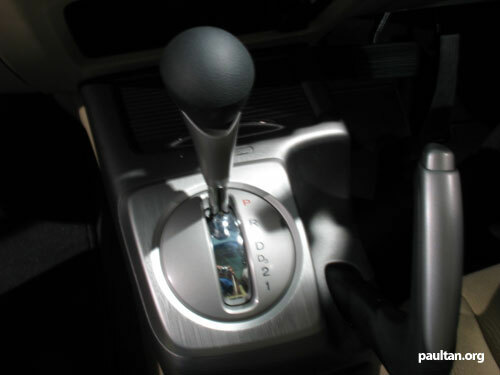 Like the 1.8S, it also has a 5-speed automatic transmission but the 2.0S has a paddle shift option. What you do is you shift the gear lever to the S option. Then you can control the gear changes with paddles at the back of the steering wheel. Left paddle for downshift, right paddle for upshifts. Honda calls this S-matic. Feels much more natural than the strange Steermatic buttons on the Honda City where upshift and downshifts are on both sides of the steering wheel. Paddle-shifts instead of button-shifts are so much more F1-style! 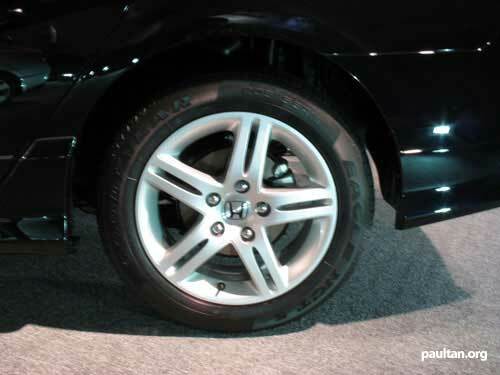 Both the 1.8S and the 2.0S has ventilated discs for the front and solid disc brakes at the back. Suspension systems MacPherson Struts for the front and Independant Double Wishbone for the rear. I don’t think much lowering is necessary for this car as the gap between the wheel arch and the tyre is already small. Gap between wheel arch and tyre not overly big, for that lowered sporty look. You can lower it somemore if you want but it would be overkill. 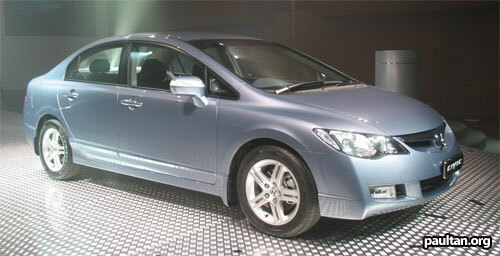 As for dimensions, the new 2006 Honda Civic is 4540mm long, 1755mm wide, and 1435mm tall. It has 2700mm wheelbase, and 155mm ground clearance for the 1.8S and 150mm ground clearance for the 2.0S. Fuel tank capacity is 50 litres, which means a full tank with RON97 petrol for the new 2006 Honda Civic would be RM96 as of today. Shell V-Power would cost you RM107.50. How big of a hole in your pocket? Honda aims to sell 6000 units of the new 2006 Honda Civic this year, making up 20% of it’s total sales target of 30,000 units for 2006. 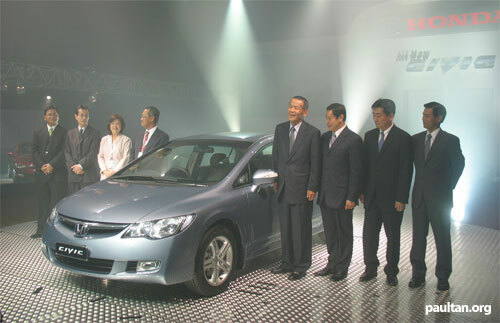 The 8th generation Honda Civic is a CKD model assembled in Honda’s plant in Malacca. The Honda Civic 1.8S goes for RM117,800 while the Honda Civic 2.0S goes for RM131,800. Very competitive prices. I’m sure the 1.8S would appeal to the executive who has been given a RM120K company car budget with his new job. Delivery for the 2.0S will only begin end of April as Honda wants to concentrate on the 1.8S to ensure quality standards are met. Colour options are Nighthawk Pearl Black, Habanero Red Pearl, Alabaste Silver Metallic, Bronze Silver Pearl and Bluish Silver Metallic. I’ll try to get a test drive and post what I think on the new Honda Civic’s drive and feel soon.